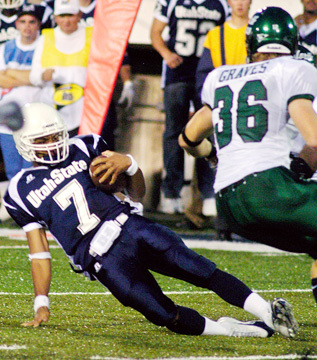 Quarterback Leon Jackson III is Utah State's leading passer and rusher. Utah State and Hawaii are two teams still trying to find themselves as their seasons wind down. Both have had opportunities for more wins -- Utah is 2-6 and 1-4 in the Western Athletic Conference and Hawaii is 3-6 and 3-4 -- but both have had problems sustaining drives, hanging onto the ball at key points and wrapping up opposing ballcarriers and wins. Turnovers plagued UH last week in its loss at Nevada; two in the fourth quarter cost the Warriors 14 points, and the defense failed to cause any. "Within a 10-play span there was a 21-point change," UH coach June Jones said. "We fumble it and we throw an interception and all of a sudden its 38-21." Meanwhile, the Aggies were fumbling six times, losing four of them, in a 27-17 loss at home against Louisiana Tech. USU has stayed close to most opponents in the first half, but faded late. "We've just got to learn to finish," said USU special teams player and reserve defensive back Toriano Taulogo, a Kahuku alumnus. "We start fast every game." When Hawaii has the ball: The Warriors are second in the nation in passing yardage per game, with Colt Brennan throwing for 354 yards per game and a total of 25 touchdowns. But the running game could be a character on "Lost," ranked 115th in the nation with a measly 75.9 yards per game. "The biggest thing for them has been as the quarterback goes and the big plays go, they score," USU coach Brent Guy said. "We cannot let them have the big plays. They are going to try to get the ball down the field on us vertically and they have got some guys they can do that with. ... We have got to get to him before he gets the ball off." If the Warriors don't do a better job up front than last week, when they allowed five sacks, that could happen. "We played the worst we've played on the offensive line," Jones said. "They're the best front four we're playing, that's for sure. They don't blitz a lot, but they can rush the passer." E.J. Reed, another Kahuku grad, starts at tackle for USU. UH freshman receiver Davone Bess is playing himself into All-America consideration. He is second in the nation in receptions and has four 100-plus yard games in a row. When Utah State has the ball: Sophomore quarterback Leon Jackson III is the Aggies' leading passer and rusher. "He's absolutely their go-to guy," UH defensive coordinator Jerry Glanville said. "They design lots of runs for him, including a lead draw. It tells you what they think of him because in situations where teams give their best back the ball, they give it to him. He's by far their best athlete." The Aggies are trying to diversify their attack, though. "Anybody who looks at the film sees an unbelievable amount of variation on offense," Glanville said. "If you sit there and watch seven or eight plays, you might never see the same group of players twice." Receivers Kevin Robinson and Tony Pennyman are Jackson's top complementary players. Special teams: The Aggies have a clear advantage in the kicking game. Robinson has returned a punt 87 yards for a touchdown, and Pennyman has a 92-yard kickoff return for a score. UH freshman kicker Dan Kelly has had four attempts blocked (two field goals and two points-after-touchdown). The Warriors allowed five sacks in their 38-28 loss at Nevada last week, with six different Wolf Pack players partaking. UH faces a more concentrated challenge this week, as Aggies defensive end John Chick is by far USU's sackmaster with 8 1/2 QB dumpings to his credit among his 13 tackles-for-loss. He leads the WAC and ranks sixth nationally in sacks per game. The 6-foot-4, 257-pound senior operates out of a four-man front this year. USU used a 3-4 last year, in which Chick played outside linebacker. "I prefer (the 4-3) a lot," he said. "I love being a rush end, it's more natural for me. I get to go into the backfield to make plays, pressure the quarterback. Before I had to watch a lot and drop back some times. Not as many opportunities." The durable and solid Tala Esera (6-3, 291) will be tasked with keeping Chick out of the Hawaii backfield. Esera, a junior, has started 30 of UH's last 31 games at left tackle after converting from defensive line following his 2002 redshirt season. The Kahuku High School graduate was honorable mention All-WAC last season. WR 6 Kevin Robinson 6-0 190 Sr.
LT 72 Donald Penn 6-3 313 Sr.
LG 67 Ryan Tonnemacher 6-4 280 Fr. C 60 Nick George 6-2 257 Sr.
RG 63 Pace Jorgensen 6-5 314 So. RT 76 Malik Cin 6-5 314 Jr.
TE 87 Jason Stephens 6-5 254 Jr.
WR 1 Tony Pennyman 5-9 163 Jr.
QB 7 Leon Jackson 6-2 190 So. FB 25 Lynwood Johnson 6-1 222 Fr. TB 17 Ryan Bohm 5-11 202 Fr. E 56 Jarom Fano 6-1 260 Sr.
T 54 Brian Sol 6-3 318 Fr. T 79 E.J. Reid 6-1 302 So. E 37 John Chick 6-4 257 Sr.
LB 45 Devon Hall 6-3 200 Fr. LB 53 Jake Hutton 6-0 215 Fr. CB 21 Jarrett Bush 6-1 192 Sr.
FS 24 Antonio Taylor 6-1 203 So. SS 26 Andre Bala 5-11 190 Sr.
RC 23 Josh Taylor 6-0 180 Fr. K 13 Justin Hamblin 5-11 142 Jr.
P 13 Justin Hamblin 5-11 142 Jr.
SN 91 Jeff King 5-11 206 So. KR 6 Kevin Robinson 6-0 190 So. PR 6 Kevin Robinson 6-0 190 So. H 9 Terrance Washington 5-11 193 Jr.
PR 34 A.J. Martinez 5-10 177 So.